Note: Any spellings that differ from the newspaper story are from official athletic department records. The Lincoln Evening News report of the game said poor coaching and punting were Nebraska's downfall against Kansas in the first meeting between the schools. The Kansas eleven was stronger than the university eleven in team play. Individually the Nebraska boys play just as well, but the lack of proper coaching is evident, the story said. BEAT THE BOYS. Kansas Defeats Nebraska by a Score of Twelve to Nothing. Saturday would have been a perfect day for football had it not been for the high wind which blew from the south. The crowd present was larger than that at the Illinois game, and it witnessed the best natured and fastest game ever played in Nebraska. There were many carriages drawn up along the field and their fair occupants seemingly enjoyed the game very much. 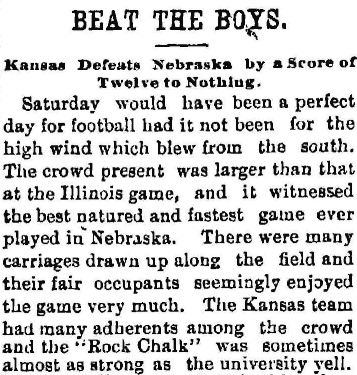 The Kansas team had many adherents among the crowd and the ''Rock Chalk" was sometimes almost as strong as the university yell. The teams lined up at 3:15 in this order: Nebraska. Kansas. A.A. Yont, Dumm, Church left end A. Foster Howe left tackle Matteson J.G. Yont left guard Hamill Hopewell center Coleman Jones right guard Hudleson Sinclair right tackle Mendall Oliver right end Shepard Pace quarter back Williamson Flippin left half Kinzie Johnson right half Springer Mockett full back Piatt On the toss Kansas won, and took the south goal having the wind with them. Nebraska started the ball with the wedge and gained ten yards. Then Flippin knocked out eight yards more around the end. Mockett tried the left end but was downed by Dumm without much gain. In tackling him, Dumm hurt his ankle and Foster took his place. Flippin made a futile attempt to gain around the right end. Nebraska had now four yards to gain in one trial. Flippin butted the rush-line with head down but could not make it and the ball passed to Kansas. The ball was passed to Matteson, who ran like a deer around the right end. Aided by systematic and skillful blocking he gained twenty-five yards for Kansas. Kinsey and Springer bucked the line twice each for thirteen yards. Then little Prof. Shepard made a gain of fourteen yards around the left end. In all the runs made by Shepard and Matteson the blocking of the Kansas team was excellent. Kinsey, Piatt and Springer were sent against the line and drove the ball to three yards from Nebraska's goal. At this point the ball was fumbled and twenty-two men piled up in a heap on top of it. When they were unraveled Flippin was found at the bottom with the ball in his arms. The Nebraskans were desperate and Flippin, Johnson and Mockett hit the line like catapaults, gaining about ten yards. Mockett again bucked the line but lost the ball to Kinsey. The ball was passed to Kinsey who was downed six yards behind the rush line. This aroused the Kansas men and on the next trial Matteson passed around the right end across the goal line and secured the first touch down. Piatt kicked an easy goal. 6-0. From this time Nebraska played Kansas an even game. They bucked the line with spirit. Although the ball frequently passed to Kansas through inability to gain five yards, the Kansas men were unable to make very large gains through the line or around the ends and Nebraska would again obtain the sphere. Kansas gained her other six points in the first half in this manner: Unable to gain by rushing the ball they were forced to depend on Piatt's punting. One of these punts was stopped by a pretty jump by Oliver and resulted in a loss to Kansas. But toward the end of the first halt Piatt made a long punt with the wind; Mockett caught the ball and started to run but neglected to hold it firmly. Kinsey snatched it from him and had a clear field to the goal, obtaining a touch down which he should not have had. Piatt again kicked goal making the final score 12 to 0. In the second half the ball remained near the center of the field throughout, never passing the twenty-five yard line on either side. It abounded in pretty tackles and good plays. Had Nebraska been able to depend on Mockett's punting and made use of the strong wind in the second half the score might have been tied. For the Nebraska team, Flippin played his usual strong game. He is undoubtedly the best man in the team, but his blocking is not so good as it might be. Oliver at right end played an excellent game. He is a better end than full back. Mockett made some good tackles, notably his tackle of Matteson on his first long run, but has punting was woefully poor. Pace's play was in no way inferior to Williamson's strong game. Jones in the rush line had the best of Hamill, the hole-maker. Whenever Flippin bucked the line at right guard he seemed to make good gains. Hopewell at center played a steady strong game. The Kansas eleven was stronger than the university eleven in team play. Individually the Nebraska boys play just as well, but the lack of proper coaching is evident. It is no discredit to young Yont to say that we have no end equal to Shepard, who played that position for three years at Cornell. In Kansas Matteson, Shepard and Kinsey carried off the honors of the day. The game was notable for the absence of slugging and ill-natured work of every kind. In conclusion it may be said that with the same training the university boys could put up as good if not a better game than any team they have met this year.